8:56 PM: Police kept protesters in San Francisco corralled to sidewalks and outside of BART station fare gates tonight, preventing any major traffic disruptions or station closures. Two protesters were arrested at the Embarcadero station after the men crossed a fare gate. One of the protesters who was arrested spoke to the crowd with a megaphone before crossing into the paid area of the station, announcing that BART administration, and not protesters, were responsible for the previous weeks’ station shut downs. The protesters had gathered surrounding the fare gates, which BART has said is a free-speech zone. The demonstrator addressing the crowd used a ticket to pass through the gates, and told the crowd he was about to “test” that principle. After briefly leading the crowd in a chant of, “No justice, no peace, disband the BART police,” he left the paid area and returned to the crowd. BART closed no stations, and all trains ran on time. The protest started outside the Civic Center station at around 5 p.m., heeding calls by organizers not to gather on the Civic Center station platform, where BART police made swift arrests last week. They attempted to march down Market Street, as they had last week, but San Francisco police blocked any attempt the crowd of about 50 made to move into the streets, keeping them on the sidewalk. The crowd yelled, “pigs go home” at the officers keeping them confined to the sidewalk. They marched east on the sidewalk on Market Street, and made stops at the Powell and Montgomery stations, protesting briefly inside the stations but outside of the fare gates. They did not attempt to enter the paid areas. After the arrests at Embarcadero, there was a brief confrontation with BART police, who kept protesters from entering the station. They then left the station, and attempted to move onto Market Street, but were again blocked by San Francisco police. Protesters then walked quietly back to Civic Center Plaza, where a few entered the Civic Center station, but they did not make any attempts to disrupt service. The group had instructed protesters tonight to hand out fliers stating their demands instead of entering the stations. Anonymous began its protests after BART shut down cellphone service at several stations during a separate protest over the shooting of 45-year-old Charles Hill. Hill was fatally shot July 3 by BART police after he allegedly threatened officers with a knife and a broken bottle, police said. “Interfering with the commute is not making much of a difference at BART headquarters,” Sturges said. The page said there would be a counter-protest tonight. “BART commuters are sick and tired of ‘protests’ interfering with our right to use public transit, so we can earn a living and get back to our families,” the site states. Despite a few brief confrontations with bystanders, there were no signs of counter protests. BART shut down cellphone service in the stations during a protest Aug. 15 and has closed multiple downtown stations in response to each protest. Last Monday’s protest resulted in the closure of the Civic Center and Powell Street stations and the arrest of about 40 people by San Francisco police. 7:01 PM: BART police arrested two protesters at the Embarcadero station in San Francisco tonight after the men crossed a fare gate. Protesters had gathered at the Embarcadero station after walking from the Civic Center station. They also made stops at the Powell and Montgomery stations during their march. They were waving signs, chanting and asking for the disbandment of BART’s Police Department, but they were following organizers’ requests to stay off of train platforms until just before 7 p.m.
After the arrests, protesters headed back in the direction of the Civic Center station. No stations had been closed as of about 7 p.m. The group began its protests after BART shut down cellphone service at several stations during a separate protest over the shooting of 45-year-old Charles Hill. Dr. Rupa Marya, a former doctor of Hill’s, was expected to be in attendance at today’s protest aiming not to disrupt commuters “but to educate a population that may need to pause and think about the value a human life has,” she said in a post on her Facebook page. Someone set up a Facebook page titled “Commuters Take Back BART.” The page said there would be a counter-protest against the Anonymous event tonight. “Let’s take back BART from these misguided protesters and show them they are way outnumbered and will not shut down BART again,” it reads. There have been no signs of counter protests. 6:33 PM: Protesters were walking from one Bart station to another along Market Street in San Francisco tonight calling for the disbandment of the agency’s Police Department. They started at the Civic Center station around 5 p.m. and then continued on to the Powell, Montgomery and Embarcadero stations. They were waving signs, chanting and marching, but they were following organizers’ requests to stay off of BART platforms. No stations had been closed as of 6:25 p.m. But as of about 6:30 p.m., there were no signs of counter protests. 5:44 PM: Dozens of protesters waving signs, chanting and marching around San Francisco’s Civic Center Plaza tonight followed organizers’ requests to stay off a BART platform as police in riot gear kept an eye on them nearby. The group had instructed protesters tonight to hand out fliers stating their demands instead of entering the Civic Center station. Someone set up a Facebook page titled “Commuters Take Back BART.” The page states there will be a counter-protest against the Anonymous protest tonight. But as of about 5:30 p.m., there were no signs of counter protests. BART held a community meeting last Wednesday to discuss the cellphone issue. 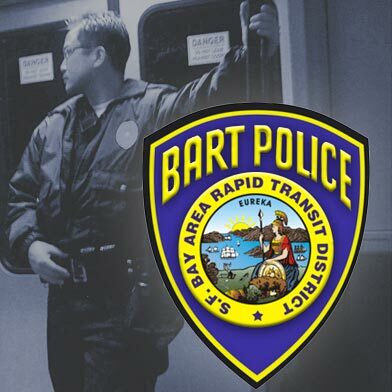 BART spokesman Jim Allison said that tonight, there will be a similar BART police presence in the stations to that of previous weeks. “We support peaceful protests so long as they’re outside the fare gates,” Allison said. Allison said, however, that if protesters are demonstrating inside the station, they could be arrested.